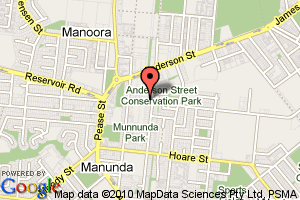 based in Cairns, Queensland, Australia. 20/117 Anderson St and McCormack St.
Email your orders now! Send us the Specification of Finished Cut Size and we can cut Full Rolls for you at $1/meter Cutting Fee. Call 07 4053 7200 M 0450007649 or Contact us for queries. We have new arrivals coming and need Floor Space. email for your FREE Samples here. New Arrivals in Terry Toweling: Navy, Black, Aussie Gold, Royal Blue, Red, Jade and Bottle Green. get a 20% Discount off Retail Price, Email your order here! 20% off the Retail Price! 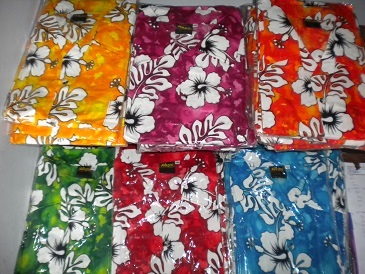 RAYON and 100% COTTON NEW ARRIVALS TROPICAL PRINTS SALE!!! We are now a proud Member of BarterCard. *Customer Name *Card No. *Expiry Date. FabricsPlus celebrated 18 years of Trading at the old address at Shops 2-9 Marino's Arcade, 70 Grafton Street, over 13 years of which has been under the new owners since October 27, 2003. Having been across OfficeWorks at 7/24 Florence St., for over a year, we have outgrown the premises and have moved to a bigger and better location with ample parking, better display area, wider range of fabrics, cheaper prices and better customer service and product knowledge than any of our competitors in Cairns. We celebrate this historic occasion at its new premises and opens the door to all. Come and visit us! You can now shop in the comfort of your own home, club, car, office, store, factory, shop, warehouse, internet cafe or hotel and benefit from our highly competitive prices available at your fingertips! FabricsPlus presents you with a wide range of products and services. As our products are continuously replenished, we will try to regularly update our site. The products in our virtual showroom, however, only represent a fraction of our full range. If you require products that you cannot find on our site, please do not hesitate to Contact Us and we will try our best to assist you with your needs, or better still... come and visit our Showroom. Additionally, you may choose to receive our Newsletter and be the first to know about our new arrivals and items on special. You can visitWholesale prices online or request prices for Bulk Orders. Become a Member of CL UB for F R E E and your details are remembered for you automatically so that you will not have to retype your login, payment and shipping information every time you visit our site. You can also access a Member's Catalogue and you can choose your desired products and print your own catalogue online. We try to make shopping on our site easy and convenient for you. Shop securedly and safely with our Shopping Cart SSL Encrypted website. We respect your privacy and will ensure your information is kept in total confidence. You may nominate your payment method by Credit Card or Direct Deposit to our Bank Account and your order and payment may be effected through our secured website, or alternatively, if you do not wish to transact over the internet, by Phone, Fax, Email or Post. Our checkout system provides for all these options. Payment by Visa, MasterCard, AMEX, Diners Club and Bankcard are available. Once you have completed your shopping cart checkout processing, pay offline and login to Paypal. 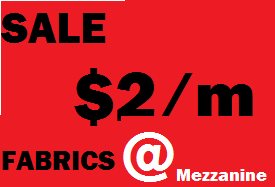 You can also send payment to wholesale@fabricsplus.com.au should you decide to use Paypal as a method of Payment. Overseas Customers please note that Credit Card facilities are only available with prior agreement. Contact Us for more details. Overseas orders,shipping confirmation and costs, etc. are advised by email and are subject to your acceptance. You may also change your shipping options through our checkout system should you require delivery to an address other than your contact address. You may pick up your order at our Showroom in Cairns, instead of paying our highly competitive freight charge, or have it forwarded to your nominated shipping address. for anywhere in Australia (conditions apply). Orders under $100 are subject to our minimum order of $20.00. Insurance, Seafreight and Airfreight Charges may be additional. Please refer to our Terms and Conditions. for every $20.00 online order. Not only are we servicing the whole of Australia, but we are also happy to let you know that we have gone international, exporting to Asia, Australasia, South Pacific and the Americas. Our neighbours from New Zealand are not too far away and are just a parcel post away. A lot of people are taking advantage of the $5/order FLAT RATE for Postal Shipping for orders under $100 . Do not forget that over $100 local Australian orders are sent to you FREIGHT FREE from Cairns, Queensland. International Orders are sent based on the urgency of orders. Affordability based on various options available, whether it is economy air, express, seafreight or airfreight.... are on offer. We have received a good batch of Cotton, PolyCotton, Polyester Dress Materials, Upholstery Fabrics and Sheeting as well as lots of Calico available in .9/1.4/2.5widths. Vinyl has been proven to be a cheaper option for upholstery. Tropical Prints in Rayons and Mercerised Cotton are very popular. New arrivals every 3 weeks. Email us now for samples. School Plays, weddings, races, tombstone opennings, first shave ceremonies and initiation rites and carnivales take center stage. Purchase Orders are acceptable. Rolls and rolls of tulle, satin, satin back crepe, rainbow chiffon, delustered satin, chiffons, georgettes, mesh, polylining, tafetta, microdots had been dispatched to a lot of stage plays across Australia. 2.7m wide width sheeting and 2.8meters wide with curtains in sheers and lace continuous curtains are new arrivals! Lots of white materials for weddings in 1.10m, 1.5m, 2.4, 2.8m wide for back drops. Send us a line for wholesale prices at email us. Don't forget that students and teachers get 15% Discounts with their IDs. Indigenous Prints with colourful and meaningful designs are now available online. Checkout our Lycra range in Cotton Spandex, Cotton Printed Lycra, Nylon Elastane and PolyNylon Spandex. Just added are the Crystal Organzastocks colours that are just so beautiful to behold. We have also added a Kids collection. More Tropical Prints have also been updated. Make sure they are cold washed. Often I have been asked and often my answer is standard....all fabrics have to be prewashed prior to sewing and yes, they will all shrink, with % of shrinkage varying according to fabric type. Water Proof & Water Repellant Fabricshave been put online for those wet products and outdoor living. Excellent for making baby nappies, baby and pet cots, swimwear bags, etc. MicroDots colours had been individualised to make it easy for ordering. Chinese Brocade goes online next week. New stock lines coming up are Terry Toweling. There's lots more to come. Keep watching this page. All resellers and those with ABN No.s also get TRADE DISCOUNTS of 15% every time an order is placed. Charitable, profitable and non-profit organisations also get 20% Discounts. Buy in BULK and get BULK PRICES as well. All you have to do is ask. Have a winter wedding with delustered bridal satin, tafetta, silk dupion, crepe, chiffon or georgette or lace. If we do not stock it, we'll find it for you and will be at your doorsteps within a week or so!!! See you online or at the shop!!! 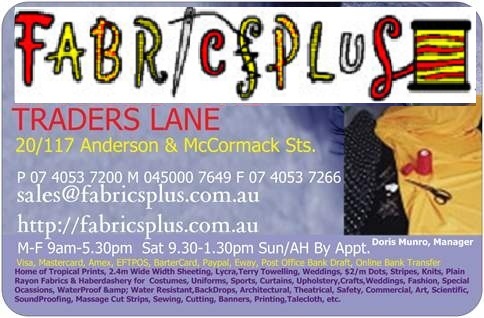 Better still, get a $20 or more Gift Voucher for that fabric and haberdashery present! We have many items included in our Specials. HOT Products included in our current SPECIALS and marked with this logo are priced even lower than our special pricing....even more savings!! The colours on the images may not exactly match the fabric colours. Enjoy shopping and have fun browsing! 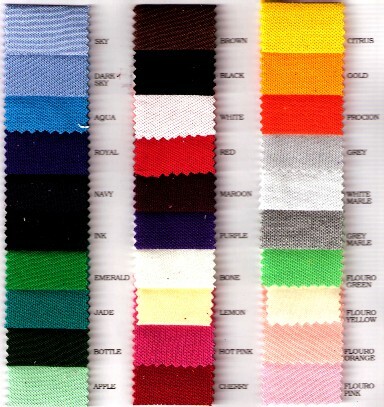 Costumes, Uniforms, Sports, Curtains, Upholstery, Crafts,Weddings, Fashion, Special Ocasions, WaterProof & Water Resistant, BackDrops, Architectural, Theatrical, Safety, Commercial, Scientific, Art, SoundProofing, Massage Cut Strips, Sewing, Cutting, Banners, Printing, Talecloth, Wide-Width Fabrics, etc.